Double Pumpkin Muffins - Do You Know The Muffin Man? 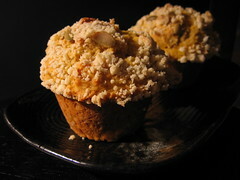 Notes: This recipe features pumpkin puree in the batter, as well as seeds in the muffin and as a topping. It's a bit more work than most recipes, as there is a separate streusel that needs to be made. I baked two pie pumpkins in the oven and pureed the flesh in a food processor (I'm using the leftover pumpkin later this week). Because it uses melted butter, the muffins are a little dense, but the orange flavour and crunchy seeds make it pretty tasty.